The Direct to Garment Process: What Happens If I Don’t Pretreat? 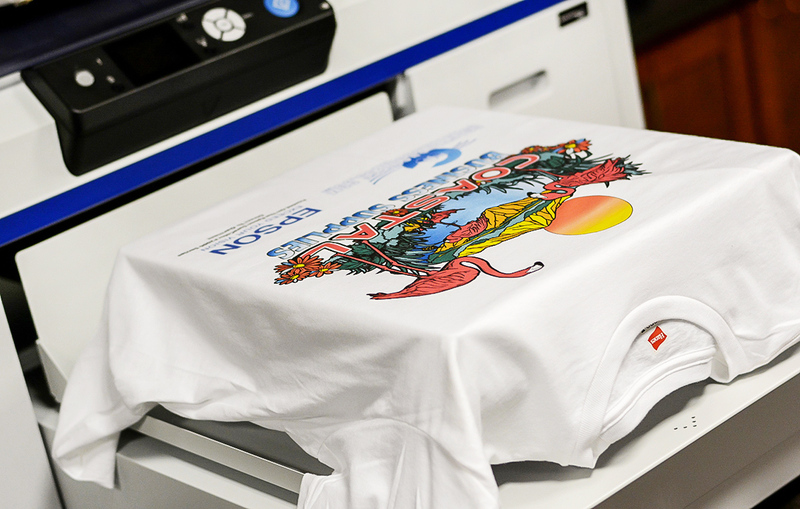 Direct to Garment printing is a revolutionary digital printing method for customer T-shirts which offers the look and feel of screen printing but in a much more simplified process. 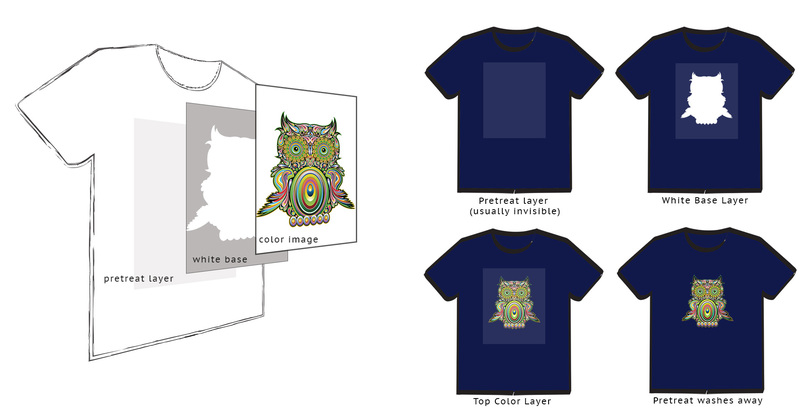 A T-shirt is simply laid onto the flat bed of the printer and the image is directly printed onto the shirt in full color. To ensure that the printed image actually shows up on a colored or dark T-shirt however, there are a few extra steps we need to take. The most important step is to always pretreat the garment with “pretreatment” solution. Pretreatment is a milky or clear liquid that acts as a primer base and prevents the ink from soaking into the shirt and disappearing into the fibers. It also helps the water based inks stay put during printing and not mix with each other while still wet. 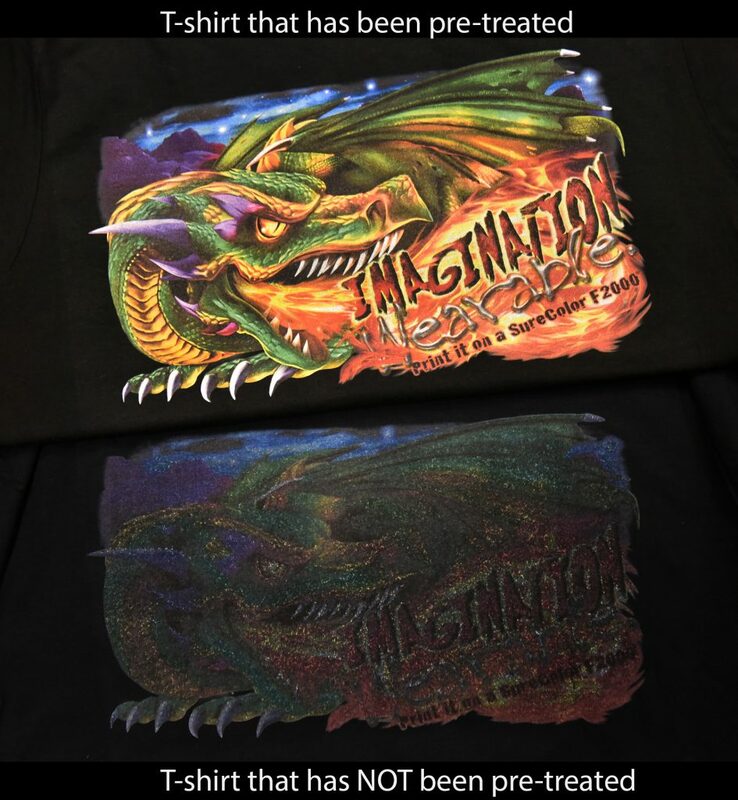 Pretreatment is especially important for the white base that is printed underneath the colors to make them pop! The pretreatment liquid is applied onto the shirt by either a hand sprayer or a spraying machine , then allowed to air dry or dried under a heat press and finally pressed at 338F for 40-45 seconds at medium pressure to set the pretreatment. The layer should be close to invisible and will completely wash out after the first wash.
What happens if we don’t pretreat the T-shirt? Nothing good. The white ink soaks right into the T-shirt, leaving the rest of the colors with nothing to sit on top of. The result is a muddy mess due to the rest of the colors soaking further into the fibers and bleeding into each other. Lesson learned: Always pretreat a T-shirt that is a brighter or darker color (you may be able to pull off a light gray shirt or tinted off-white but that’s about it). There are a few brands of pretreatment available, but generally the pretreatment liquid and the inks should be the same brand. Our top choice is the Epson SureColor F2000 Pretreatment Liquid which is compatible with the same brand printer and inks. It comes as a concentrate and needs to be diluted with distilled water. For best results, we recommend using the pretreatment process on any colored shirt. Even light colored garments can show through the design and tint it slightly.